Information for Sled Dog Races on Snow! With two sled races coming up in February, the PSDC wishes to remind mushers about the rules for our races. Tug Hill Challenge is Feb. 16-17 and is open to all mushers in all classes. The Canyon Sled Dog Challenge is only open to 8 and 6 dog sled teams and 3 dog skijor. Be sure to check our events link on Facebook and our website for more info on those events. 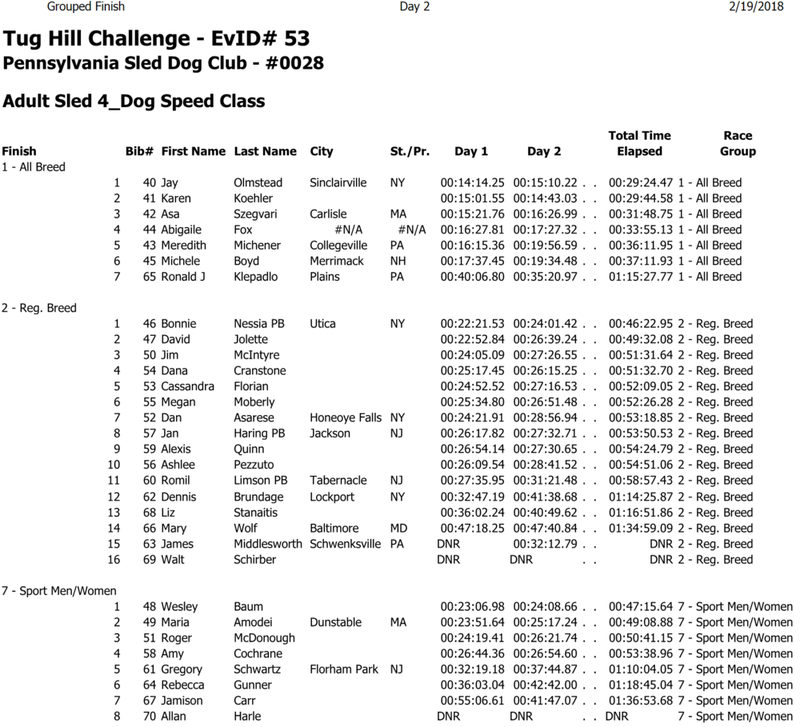 The Pennsylvania Sled Dog Club (PSDC) prioritizes the safety of dogs and participants at all of our events. Thus the Board has approved an updated requirement that mandates that sled drivers wear helmets at our sprint snow races. Information about our current safety requirements follows. “All drivers in any snow sprint class shall wear an adequate, properly fitting helmet”. Anyone driving a sled in a sprint race must wear a helmet. Any skijor participant under 18 must wear a helmet. Anyone under 18 driving a sled in a mid-distance race must wear a helmet. Anyone on a fatbike in a snow race must wear a helmet. Anyone (driver or rider) on motorized equipment working as trail help, training or any other use must wear a DOT approved helmet. Anyone on any wheeled vehicle (rig, bike, scooter) at a dryland race must wear a helmet and protective eyewear. All participants are subject to any additional stricter race- or event-specific helmet and safety requirements. For anyone over 18 driving a sled in a mid-distance race, a helmet is recommended but not required. For any skijor participant 18 or older, a helmet is recommended but not required. For anyone running canicross, a helmet is not required. For any other situation, you need a helmet! Do the safety rules apply only to races? No. All safety rules apply to all PSDC events, including club sponsored training events and demonstrations. What does “adequate, properly fitting helmet” mean? Race/event officials will make the final determination of what is “adequate” and “properly fitting”. Standard ski, snowboard and DOT approved ATV or snowmobile helmets are acceptable for snow races. Bike and DOT approved helmets are acceptable for dryland races. Broken helmets are not acceptable. Helmets that are too large or too small for the wearer are not acceptable. Helmets missing a chin strap are not acceptable; use of the chin strap is required. Plopping a bike helmet over the top of a knit cap at a snow race would not be accepted – it is neither adequate nor properly fitting. The objective is that the helmet fits to behave as designed in a fall. What if I don’t have a helmet or it’s ruled as “inadequate”? You will not be permitted to start and be on the trail. If the determination is made in the start chute, you must take your team from the chute, get a proper helmet and go to the end of the start line. You will be considered a “late starting” team; your race time begins at your original scheduled start time. Intentionally disregarding a ruling about a helmet or any other safety rule will result in a class disqualification. Race officials may impose additional penalties for repeat offenses. Do you have a recommended helmet style or brand? No, the club does not recommend a particular style or brand of helmet. We do encourage you to review helmets that incorporate MIPS technology (Multi-directional Impact Protection System). May a race official waive the helmet requirement? No race official or club official may waive any safety rule. How does this apply at the Tug Hill Challenge? If you are a skijor participant (skijor class or novice class) and are 18 or older, you don’t need a helmet. If you are a canicross participant, you don’t need a helmet. Otherwise, a helmet is required! How does this apply at the Canyon Sled Dog Challenge? A helmet is recommended, but not required on race day (Saturday) for anyone 18 and over; a helmet is required for anyone under 18. Helmets are required for ALL drivers on the exhibition day (Sunday), including drivers running the entire distance of the trail. Are there any other safety rules I need to know about? A race or event may impose additional requirements; these will be listed as part of the race/event registration. For example, kick sleds are not permitted at the Tug Hill Challenge (not permitted at any PSDC race), and sled drivers may NOT be attached to their sled by any means, including wrist wraps. For the Canyon Sled Dog Challenge, a driver must carry first aid gear, knife and spare booties. We would also like to point out that kick sleds are not acceptable in our races, even the junior races. This is a safety issue for us and they don’t meet several requirements. Fat tire bikes are an up and coming entry. Please be sure your equipment is correct. Standard fat tire bike with working brakes, 1 or 2 dogs. Dogs are harnessed to the bike, not the driver, by a line that is 7-12’ long and includes a shock section. Measurement is from the front tire of the bike to the harness. Choke collars and muzzles are not allowed. Driver must wear a helmet. For all races: Driver must wear a helmet. Dogs must be current on all vaccines. (Bring your paperwork! It may not be needed, but better to have it. If you are running in pure bred class, bring paperwork for that as well.) A complete set of rules for PSDC races can be found on Policies & Procedures. Tug Hill distances are approximate at this time. 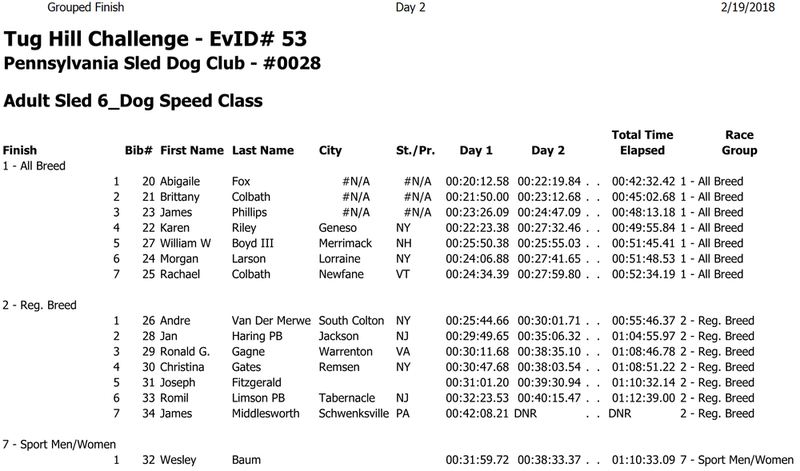 8 and 6 dog sled class, skijor class: 6.4 miles; 4 dog sled class: 4.5 miles; Junior and Novice class: 2 miles. Dan Rehak is the race marshal for Tug Hill. Any rules questions will go to him. From all the pictures and posts, I am seeing on social media, folks are really anxious to get the fall dry-land and winter training seasons underway. With much too much rain and an extended warm weather pattern, many are off to a later than normal training schedule. Training youngsters and conditioning the veterans are in full swing. I want to thank the folks that stepped up to organize and present the club with a very successful summer camp out, in Morris, PA. Liz and Rich Stanaitis, Diana Geitzenauer, Mary Beth Louge, all worked together to make the weekend enjoyable, informative, and relaxing. The presentation by Laura Neesse, was well received and very inspiring. To see a young musher successfully achieve her dreams was very special. Thank you to everyone who pitched in to make the weekend a great one. We are now moving into our fall schedule. The first event will be our fall training weekend at Camp Achela in Blakeslee, PA October 26 – 28. In addition to the canine activities offered, event organizer, Luwanna Krause is planning a special event on Saturday evening. There is always lots of great food available on this weekend including our big turkey dinner that has become an annual event. Registration is available on line now. Please share this information to fellow club and non club member so many can enjoy the weekend. Soon after the weekend look for more information on our dry-land event, (Fair Hill) and our snow race (Tug Hill). Dates and details will be available soon. I want to wish all members who will soon be hitting the dry-land trails much success. For those who will be attending training seminars and trade fairs, may they be valuable experiences for all. I look forward to seeing many of you over the next few months. The PSDC will be having elections at our spring meeting in May. Nominations are open at this time for the following positions: President, Treasurer, and two Board of Directors which are currently held by Dan Rehak and Chris Jacobs. If anyone is interested in these positions or wants to nominate someone for any of these positions you can contact the election committee. Please send a statement explaining what position you are interested in along with some information about yourself. Nominations are now open through March 31, 2018. This will allow us time to get the statements out to club members before the elections. Several proposed amendments to the Pennsylvania Sled Dog Club by-laws have been submitted, and are included in this message. As a member of the Pennsylvania Sled Dog Club, you are receiving a copy of these proposed amendments for your consideration. A ballot containing these proposed amendments will be forwarded to all Pennsylvania Sled Dog Cub members in March, following the by-laws amendment procedure outlined in PSDC by-laws. If you have any comments on these proposed amendments you wish to share with other PSDC members, you may send those comments to PSDC Secretary Carolyn McKenrick. Comments received from voting PSDC members will be included with the ballots mailed out, as required by the by-laws. PSDC Secretary Carolyn McKenrick will be counting all ballots returned to her and will announce the results of the vote at the 2016 PSDC Spring Meeting. Comments on these proposed amendments you wish to share with other PSDC members should be mailed to PSDC Secretary Carolyn McKenrick at 456 Pine Grove Road, Gardners, PA 17324. Her email address is: pineymt456@gmail.com. All comments need to be sent to McKenrick by March 5, 2018. A complete copy of the current PSDC by-laws is available on the club website. Look for your ballot for these proposed amendments during the month of March. A deadline for returning those ballots will be included in that mailing. 1. The Board would like to change the position of appointed newsletter editor to appointed social media coordinator to align the by-laws with our current practice of using online social media in lieu of a printed newsletter. 2. The Board would like to eliminate the requirement to request an absentee ballot by sending a self-addressed stamped envelope and allow a ballot to be requested by email. g. appoint the Club newsletter editor and webmaster, such appointment subject to Executive Board approval. a. keep complete and accurate records of all business transacted at Executive Board and General Membership meetings, all such reports to be filed promptly with the editor and/or webmaster for inclusion in club publication(s). a. shall be charged with managing all Club public relations, excluding publication of the Club newsletter and the Club webpage, to include publicizing significant Club and member accomplishments, acting as a liaison between the Club and the media. 6. A voting member who was present at the previous autumn meeting may secure an absentee ballot by writing to the Secretary including a self-addressed stamped envelope. Call to order: President Johnn Molburg called the meeting to order at 3:10 PM. Secretary’s Report: A motion was made to accept the Secretary’s Report from the May 13, 2017 meeting in Denver, Pa., by LuWanna Krause. The Report was sent out through a mass email to all club members. George Chianese seconded the motion. Motion passed. Treasurer’s Report: A motion was made to accept the Treasurer’s Report as presented. The checking account balance at this time is $1131.82 and the savings account balance at this time is $6883.48. The motion was made by Mary Wolf and seconded by Chris Jacobs. Motion passed. A. Constant Contact Fee: Dan Rehak reported that he researched different avenues to find the most cost-effective way to do our online services such as registration for races and events. Constant Contact seems to be in line with other service providers online. He feels we do not need to change to another provider now. He did note that event organizers need to consider these fees in their budgets to help offset the cost. A. ISDRA Reports: Johnn Molburg reported for Jessicia Borman that there was not much new on ISDRA. A discussion was held on the new rig requirements for IFSS. IFSS rules stipulate that all carts must be four wheel carts. If ISDRA would adopt this rule it would affect how we run our dryland events. At this time ISDRA has not adopted this rule. B. Merchandise: Meredith Michner has been working to set up an online PSDC Merchandise Store. When Meredith is finished setting up the store it will be located on our web page. Insa Robinson will be managing the online store and you will be able to place your order electronically. C. Social Media Coordinator: Dan Rehak is currently working on a job description for this position. Liz Stanaitis volunteered to take on this position. The club will touch base with Liz to see if she is still interested in the position. D. Website: Jessica Kizmann is doing a great job on our web page. We need to keep in mind that if we want something added to the web page we need to get the information to her, so she can update the web page. All updates are done in a very quick manner. E. Audit Committee: Donna Quante & Heather Walls volunteered to be on the Audit Committee. Over this past summer they did an Audit of the PSDC Finances. They presented to PSDC General Membership an Audit Report. A copy of the Audit Report has been forwarded to our Treasure, Jessica Borman so she can make the necessary corrections. They reported that all records and documentation are in good order. The Club would like to Thank Heather and Donna for doing a thorough Audit for the club. Fair Hill – Ed Schreckner and Lynda Ninos reported December 2-3, 2017 as the race date with an alternate date of December 9-10, 2017. They gave a lineup of classes and Officials and are still working on the purse. Mount Misery – Jessica Borman and Chris Jacobs reported December 16-17, 2017 as the race date with an alternates dates of January 6-7, 2018 & March 3-4, 2018. They gave a lineup of classes and Officials and along with the $750 from the club they were working on increasing the purse. Tug Hill- Jan Haring and Jessica Borman reported that the date for this event is February 17-18, 2018. With no alternate date. They pretty much have all the Officials lined up and are working on increasing the purse. Canyon Sled Dog Challenge- Mary Beth Logue reported she is working on getting all the Officials lined up for this event. This is an 18-mile mini mid distance race. There will be 6 & 8 dog classes with Registered Breed classes for both. There is no alternate date and she also wanted to note there is no access along this trail, any drop dogs will have to be carried in the sled bag. The Wellsboro Chamber of Commerce are helping organize this event. This trails traverses through the Pennsylvania Grand Canyon with beautiful scenery along the way. Betty Carhart Race- Jessica Borman & Chris Jacobs reported this will no longer be a PSDC event. It was co run with JSSDRA, they will continue to have this race as a fun event. Spring Meeting- Jessica Borman & Chris Jacobs reported the Spring Meeting is set up for the weekend of May 12, 2018. They are planning on Samoyed dog driver Walt Herrmann as the guest speaker and planning on using the same location as last year. The Comfort Inn in Denver, Pa.
B. Club Equipment – Dan Rehak has set up the new lap top with the software Race works, so that we have a reliable source for timing races and events. Also, the club is looking into getting helmets to use at Tug Hill as the snowmobile laws of NY require helmets to ride snowmobiles out to do trail help. C. Updates to PSDC bylaws- Dan Rehak and Nancy Molburg will get together to draw up the upgrades to our bylaws. Since we no longer have a newsletter and are using social media for our information sources we need to eliminate the newsletter in our bylaws. This is one of the jobs the Social Media Coordinator will be doing. We may even discuss at some point to change when the election committee will be appointed. D. Registered Breed Class Review- Dan Rehak currently handles the Registered Breed Class, reviewing dogs listed on musher reports. He reports that all PSDC Races for all classes are offering a Registered Breed Class. A. Possible Mt. Laurel Race- Carmen Rose Sent the club information on inquiring about a race location in the Laurel Highlands. The club suggested she put a team together and do a demo type event. He also suggested laying out a 2-4-mile trail to get the feel of what would be needed to support a race. A good time for this to take place woul be in the early spring. B. Election Committee: Johnn Molburg ask the General Membership for two volunteers to be on the election committee. Offices up for election will be: President, Treasurer, & two Board of Directors. Those Board positions are currently held by Dan Rehak, and Chris Jacobs. The Election Committee would help solicited nominations for those positions and ask those interested to forward a statement to the Secretary, Carolyn McKenrick to post on the web page. They also would help count ballets at the Spring Meeting and Elections. Laurie Stone and George Chianese volunteered for the election committee. C. For the Good of the Club: Mary Wolf suggested having mileage of more than 2 miles in the canicross class at dryland events. Johnn Molburg suggested contacting event organizers to see if their races could support longer distances in this class. He also suggested putting an article on the facebook page to see how much interest it would draw. Also, Donna Quante said she was contacted by Cordorus State Park about having a race or demo at their winter festival. She will be meeting this coming week with those officials to discuss the needs of the club involving insurance and what type of course they could offer. 8. Adjournment: A motion was made by Mary Wolf to adjourn the meeting at 5:01 PM. Chris Jacobs seconded the motion. Motion passed. John A. Bilodeau-Redeye, 63 of Basom, passed away unexpectedly on Friday (November 13, 2015) in Belen, New Mexico. John and the Redeye family were regulars at the Tug Hill races and known by many PSDC members. He was born April 23, 1952 in San Francisco, CA, a son of the late Norma Poodry and Nicholas Redeye of Belen, NM. John was employed by New York State as a Peace Officer prior to his retirement and also worked at the T.P. Deli. He was president of the TIRCA Board and member of the Canadian Sledders Inc., Siberian Husky Club of Niagara Falls, the Seneca Siberian Husky Club and the co-owner of BiliRed Sled Dogs. Survivors include his wife,Catherine Bilodeau-Redeye of Basom. Brother, Thomas Redeye of Spokane, WA. Step-sister, Sharon LeRoy. Nieces and nephews, Jonathan, Barbara, Melanie and Robin Redeye. He was the brother of the late Glenn Redeye. Family and friends are cordially invited to share thoughts, condolences and fond memories on Friday (December 11th) from 7-9pm at the J. Leonard McAndrew Funeral Home, LLC, 32 John St., Akron, NY. A funeral service will be held Saturday (December 12th), 11:00am at the Tonawanda Indian Baptist Church, 565 Bloomingdale Rd., Basom, NY 14013. Interment will be in the church cemetery. Memorial contributions may be made to the American Diabetes Association, Open Arms of WNY or Volunteers for Animals. Expressions of condolence may be shared with the family at: www.mcandrewfuneralhomes.net. Paying tribute to Chris Krause, beloved husband of PSDC member LuWanna Krause.